In order to take over the valuable smile of everyone in Nagato Town to the future! 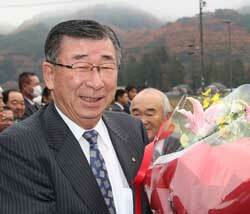 As a town mayor of "Nagato cho", it is now Kenichiro Haneda who is supposed to be responsible for the fourth term heavy responsibility. Since the birth of the town I have spent 3 periods 12 years as the town mayor of a small Nagatomachi town with a population of 7 thousand, which was born through a major merger of Heisei. The environment surrounding the prefecture and municipalities has undergone significant and rapid changes such as the progress of decentralization, the rapid progress of declining birthrate and aging population, the declining population, the expansion of the production area, the diversification of administrative needs, and the critical financial situation We are. Based on these changes, we must provide high-quality administrative services on our own responsibility and judgment. There is a need for more appropriate and rational administrative management and improvement of administrative system than before. I love the rich nature, history, culture, such as the green mountain range of this Nagato Town which I was born and raised, clear air, rich water, ruins of Kuroya stone, Nakasendo Nagakubo Inn, Wada Inn. And I love you guys who live there. The starting point of my administration administration is here. Regardless of how society changes, we aim to become Changwa Town where everyone can grow up, learn, work, and live well, aim for the town people to be the leading role, to keep in mind that each person is valued and carefully administered We will continue to advance. As Changwa Town continues to shine even further as Changwa Town, we will further promote the creation of a living area where we can realize that the smiling face of the townspeople will be handed over to the future and that it is good to live, with the cooperation of the townspeople , Your guidance, thank you for your cooperation.